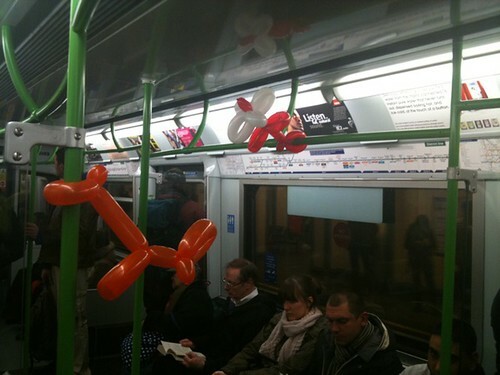 Aslefshrugged spotted these on the Central Line on Sunday "Are they deer or dogs? No idea but when I changed ends at WER today there was a whole car full of them. I love this city." There's more pictures on his blog. It's not an isolated outbreak though. 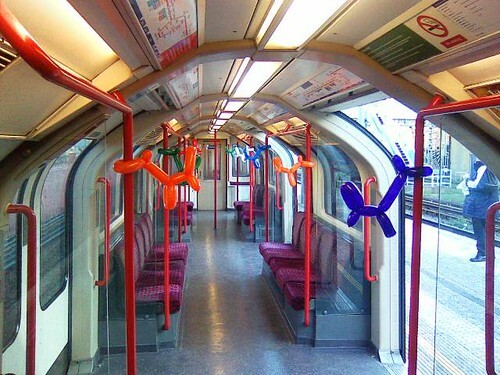 Lee Sankey said: "I was greeted by the following scene as I entered the last carriage on the Northern Line at Waterloo." Like Aslefshrugged there's more pictures on Lee's post. "How fantastic! Whoever you are, more please", Lee concluded. Yep more please! 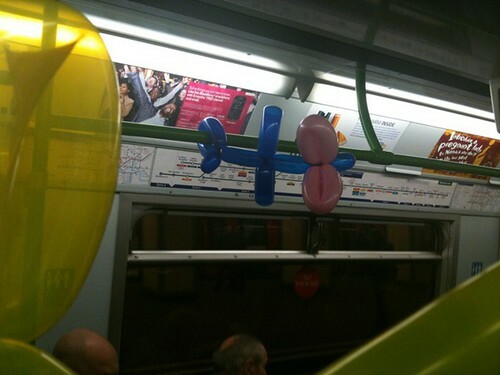 He said "No one seems to be amused by the balloon animals in the carriage. There is no pleasing some people." It pleases me & all the other people who RT'd the post on Twitter. If you've seen any more let me know. Cheers! Do you want the good news or the bad news? 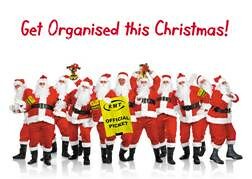 Thankfully unions RMT & TSSA will not be recommending further walkouts this side of Christmas. However, strikes in the New Year could be for two or three days. RMT leader Bob Crow told a news conference "I will not be recommending any action this side of January 2, but come 2011 we will have to consider escalating strikes to more than one day." 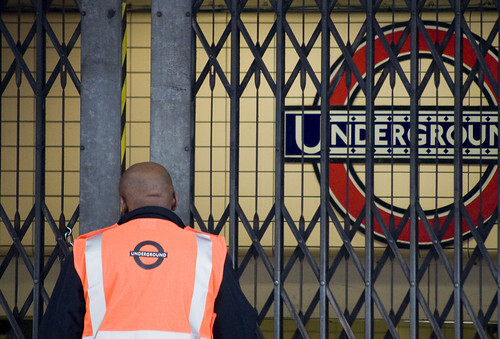 He also accused London Underground for misleading the public on the impact of today's strike. "If you believe what is on the TfL website then you believe in Father Christmas" he said. "They are using propaganda to mislead the public. They said Liverpool Street was open when it was closed and they said the Waterloo and City line was running when it wasn't." 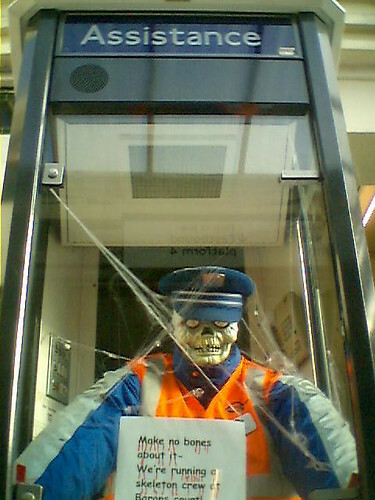 Crow claims that TfL are running empty "ghost trains" as part of a "PR stunt". He added "Once again RMT and TSSA members have stood rock solid in this dispute over Tube safety. TfL and LU have been reduced to their usual well-rehearsed lies over services that they claim are running but it is pure fantasy and simply misleads Londoners. The capital is locked down this morning across the board." TfL say that "The Northern line is running a service across the full length of the line, and the majority of the Victoria, Jubilee, District lines are also being served". How did you manage to get into work today? Did you see any empty "ghost trains"? 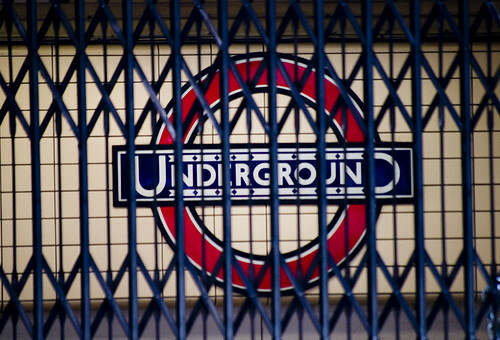 In spite of talks and the RMT & TSSA unions offering to suspend the industrial action, if London Underground agreed to a 12 week suspension of cuts, the next Tube strike remains on. Some services will stop from as early as 6.30pm on Sunday night, 28th November and then disruption is likely all day on Monday 29th November. TfL's home page this morning has details, as before, of the services they expect to run. Transport Commissioner Peter Hendy said: 'London Underground has been ready and willing to discuss any safety concerns which the RMT and TSSA leaderships may have had since these proposals were announced at the start of March. 'We remain willing to discuss these at any time. There's no mention as to why they didn't accept the offer to suspend cuts for 12 weeks in return for "a thorough station-by-station safety evaluation to take place" in that period. No doubt we'll hear more from Bob Crow on this in the coming days. But for now prepare for a more manic Monday than normal. 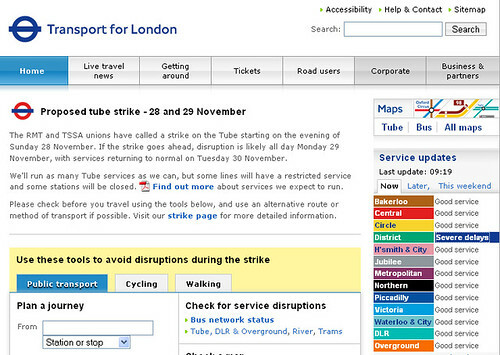 Keep an eye on the sadly all to familiar strike page on TfL's site for your travel on Sunday evening & Monday. Update - So yesterday London Underground offered to continue the review for a further six weeks (having been consulting for six months already) and the union leaders, said no and wanted 12. 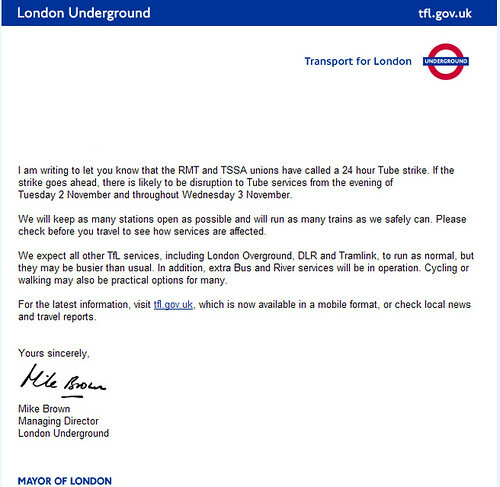 Howard Collins, Chief operating officer of LU said 'Despite this offer, the leaders of the TSSA and RMT have demonstrated once again that their only interest is in disrupting Londoners - despite the fact that over half of the post reductions have already been achieved through voluntary redundancy and natural wastage. 'If they are serious about resolving this issue, they should call off their totally unnecessary strike immediately. We will talk to them right now on any genuine safety issues they have. PS - Adam Bienkov looks at Boris's No Strike Deal election pledge, which now makes excellent reading. London Assembly member Val Shawcross shares the same view "I have leaflets Boris Johnson handed out when he was trying to get elected two years ago saying he had a plan to end strikes once and for all but it seems things are just getting worse. He needs to end his stubborn, childish attitude of not talking to the unions, get around the table and sort this out". They warn of delays of up to one hour on key Tube routes. 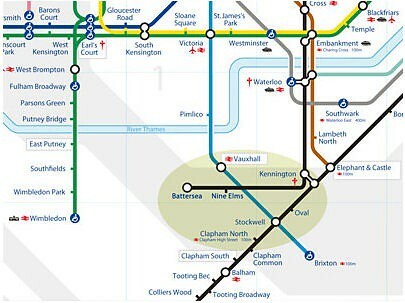 The Central and Jubilee lines will be worst hit as these are will used to take spectators eastwards to the Olympic Park in Stratford. Colin Stanbridge, chief executive of the London Chamber of Commerce and Industry, said: "There will be inevitable pressures on the transport system and it is crucial that all companies are aware of any impact on their own firm. Affected businesses will need to think ahead and should start considering plans as early as possible. They've also launched a "Travel Hotspots" map which shows how bad areas will get. It's not just limited to areas directly around the venues and includes "areas around major interchange stations, such as King’s Cross St. Pancras, London Bridge and Bank, and routes that link central London with venues." Each map has a section outlined in bold pink lettering "The following summarises what is currently predicted to happen without action by businesses to reduce the number of journeys." "The implementation of the Transport Plan will ensure that increased demand for transport services during the Games has a minimal impact on existing transport networks and commuters’ regular journeys within London. It will also ensure that spectators can easily get to and from London from across the UK, and to competition venues that are located outside of London, such as the venues for the Football competition." "As part of the transport strategy, an Olympic Transport Operations Centre (OTOC) will be established to manage all modes of transport for the Games Family, spectators, workforce, and for all those travelling for reasons unconnected with the Games. This will help Transport for London, other transport operators, the police, local authorities and those running the Games to keep London and the UK moving." Surely managing all modes of transport - means more than telling people to not use it and getting companies to make staff work from home? Why is it up to businesses to resolve the anticipated problems? I know it's early days, but yesterday's announcement sounds like the ODA are already giving up! Can the Tube cope with the Olympics? 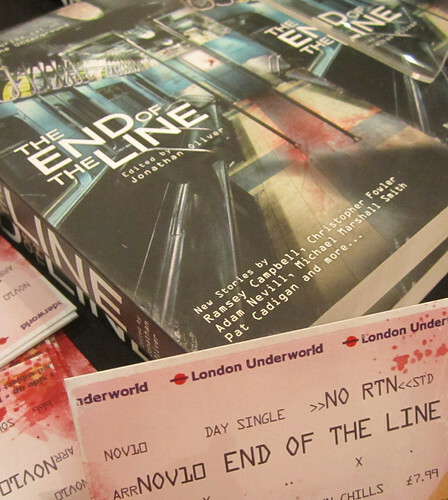 After last week's launch of The End of the Line - collection of subway themed horror short stories, I got in touch with one of the authors - Christopher Fowler. He very kindly answered a bunch of questions about his writing and fascination with the London Underground, which features strongly in his novels, short stories and even on his blog! 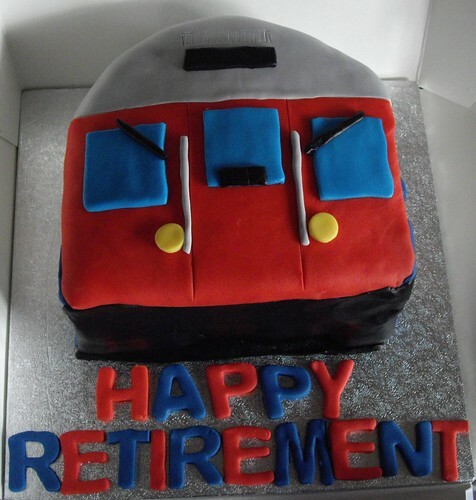 You've obviously carried out tons of research about the history of London Underground & its secrets for Off the Rails. Do any real hidden stations appear in the story? A few but not as many as I'd have liked - I tend to get carried away with research and had to stop somewhere.. Your story in 'End Of The Line' is the final one. According to an Amazon reviewer "it explores the ghosts of some major events that have happened in the history of London's Tube up the recent past. It once again shows Fowler as a writer in tune with the spirit of this great city". Why do you think we're all so fascinated with London and the Tube's past? It's an atmospheric city with constantly changing moods. Sometimes I think I'd like to live in a sunny country again, but after a while it's so boring. I miss 'cafe society' though, and the winter months are a killer. And there are lots of great stories about the Tube - I like two in 'Bryant & May Off The Rails' especially - the one about the walking sticks and the wood chips used to deaden the tracks under the law Courts, the fact that the magic shop is still there in the old Trafalgar Square Station tunnel (I visited it a few weeks ago) and Bumper Harris of course. What is or was the scariest place on the London Underground for you? This is a funny thing. I'm genuinely not scared in the underground. I feel safe and happy down there, which I know will horrify any country people up for the day. But the old narrow station platform at Angel which used to have a train on either side used to bother me a little when it was very crowded - it felt like walking a tightrope. I'm rather fond of Aldwych (sadly shut now). 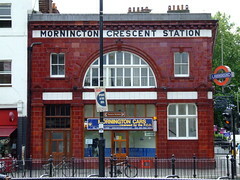 I like Mornington Crescent, and any other station that still has its tiles. I like Farringdon for some odd reason, coming out into the night there, and lots going on in an old-fashioned part of London. I hate the crummy makeover Tottenham Court Road was given in the 80s, with all the coloured tiles that were falling out even before it was finished. A shoddy, ugly bit of cosmetic improvement designed to cover up the collapsing infrastructure. You live in King's Cross and right from the start the station is the focus of a lot of the action in Off the Rails - what do you most like and most dislike about the station there? At the moment the constant shifting of the ticket hall and tunnels is driving me nuts. I know the work has to be done, but if you make a wrong turn you can walk for literally 20 minutes. I use the 'Tube Pro' app on my phone to find the nearest exits but it can't keep pace with the changes there. I love the night kiosk outside, though, as you can get your Sunday papers on a Saturday night from 10pm onwards. Your detectives Bryant and May have an office above Mornington Crescent Tube station - did you consider any other London Underground homes for them? Yes, the one on York Way which is now a TfL contract cleaning company's headquarters. Those nice maroon tiles! There's a story about two people carrying a tired looking woman on the London Underground. She was propped up between them on seats for a number of stops and legend has it, she was dead and the guys were using the Tube to get rid of her body. What's your favourite urban legend about the Tube? I like the one I put in the book about the ghost of the woman who can be seen in the tunnels at night, and of course 'Death Line', with its tale of workers trapped below ground who become cannibals. 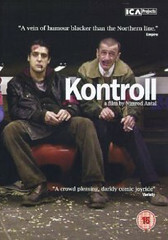 And the urban stories in the film 'Kontroll', about the Hungarian underground staff. There's the thing about fluffers having to sweep up flakes of human skin from the lines. And I have a great painting of a woman pushing a man under a train in the 1950s. 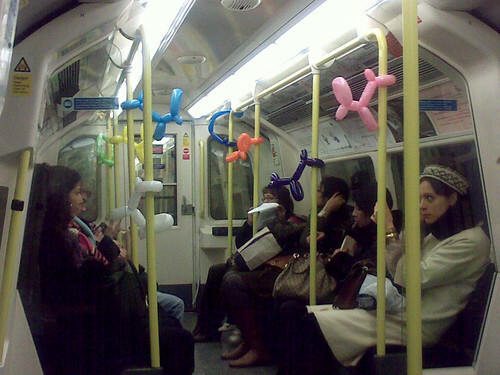 What's the strangest thing you've personally seen on the Tube? A dozen pink rubber nurses (we get a lot of hen nights on the underground at KX) and the huge cross-London drinks party that took place the night Boris banned booze on the LU. London is often described as another "character" in your novels. 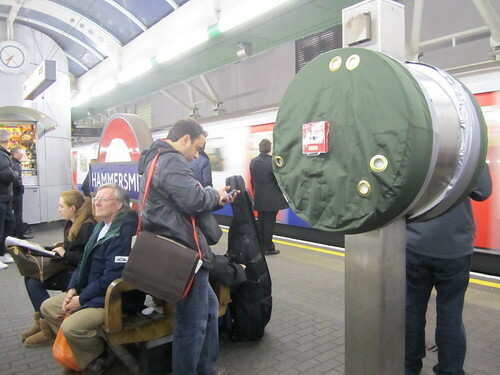 If you saw the Tube as a character how would you describe it & would you like to take it down the pub for a drink? As a sooty, grimy character actor who could tell lots of scurrulous stories. I'd take it to the Salisbury for a beer. Two of my favourite fantasy & crime authors have written novels featuring the Tube - Neil Gaiman (with Neverwhere) and Barbara Vine (with King Solomon's Carpet). Do you have any other writers of Tube fiction you'd recommend? 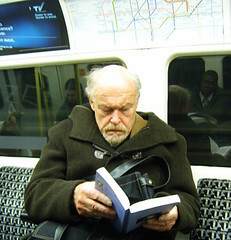 Geoff Ryman wrote a book called 253, with one page for every passenger on a tube train. And of course the anthology 'End Of The Line'. 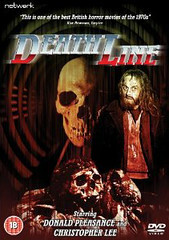 Strangely enough, there have only been two horror films based on the Tube - Death Line and Creep - which is your favourite and why? As mentioned, I love 'Kontroll' (Hungary) - that's the best one - and 'Subway' (France), also brilliant, but also 'An American Werewolf In London' and 'Death Line' is so fabulusly sleazy, and you can learn a lot about awful 70s fashion from it (mmm - afghan coats!) Another great one is 'Bulldog Jack', set in the 1930s, with Bulldog Drummond going down a circular tube staircase in a top hat, on a teatray! It looks like Bryant and May will appear on TV in the future - if budget were no option, which actors do you think would best play them? I'd like Timothy Dalton and Derek Jacobi. You have a fantastic blog and lot of interaction with your readers through it, have any of your blog commentators directly influenced your writing or do you ever ask for their help when writing? I often ask for help, ideas and criticism. Although I don't need to - they give it to me whether I want it or not! I've described the blog before as a cross between an erudite chat in a pub and a fight in a barn. Speaking of blogs, I love the way that Bryant and May are elderly but live and work in a very contemporary London. Do you think they'd ever get a handle on Twitter or blogging? I think John May would, but Arthur Bryant managed to almost collapse the internet when he tried. He damages all technology. You have a play that's just come out the Phoenix Artist's Club, called Celebrity. Who's the most famous person you've seen on the Tube? No Americans ever, but lots of great British actors from Michael Gambon to Alison Steadman, happily going to the theatre by tube. You're clearly a bit of a Tube geek and you've very kindly referenced my blog a number of times on yours. Do you have any other favourite sites about the London Underground? Finally (and with apologies to Londonist who always ask this question of London bloggers) have you ever thrown up on the Tube? No, but the morning after my very glamorous wedding I threw up in a litter bin on the Cally Road, the least attractive thing I've ever done! ..even the Help Points need jackets. Perhaps if we get snow on the London Underground, in the coming weeks we might see trains parked in depots with covers over them! However, let's hope TfL will be able to cope with the snow forecast this winter. TfL's weather section of their site (I was surprised they had one) predicts some snow for this Thursday. Last year London's buses were taken off the road and the Tube had a massively reduced service in early February due to the heavy snow. The RMT has accused TfL of "total lies" as a leaked document revealed a number of London Underground stations could be left unstaffed following staff job cuts plans. RMT leader Bob Crow said: "The management claim that they have no plans for unstaffed stations as a result of the cuts is a total lie..... They have repeatedly told the public that they have no plans to run unstaffed stations and yet this communications report shows that that is exactly what they are planning for." TfL admitted the document existed but denied lying and said stations would only be unmanned on "rare occasions". Here's the offending part of the leaked document "There are a number of stations across the network which is (sic) left unstaffed from time to time. Where this is the case without LLPA ("long line PA" system) there is no audible means of providing service disruption information to customers on platforms. 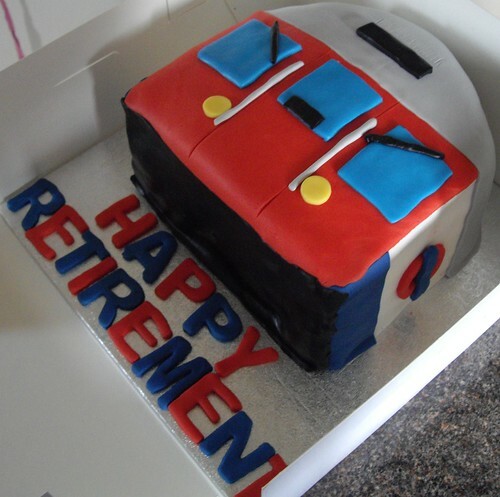 With the OSP (station staff job cuts programme) and future station staffing changes it may become more of an issue at more locations more frequently." As you know members of the RMT and TSSA have staged three 24-hour strikes in the last two months over plans to cut ticket office jobs. The next Tube strike is planned for 28th and 29th November. This current document leak obviously isn't going to help talks to stop the strike. Bob Crow said "With just over a week before the next phase of strike action on the tube by TSSA and RMT members the time has now come for London Underground/TfL to pull back from these cuts plans, which would have a disastrous impact on tube safety and services, and to start talking with the unions about a long-term, secure future for the Underground network." TfL said "London Underground has staff at all stations and staff rostered for shifts covering all hours that a station operates. This will not change. "On rare occasions, at small above-ground stations, when staff are not available for short periods due to sickness or other unplanned circumstances, a station maybe left unstaffed temporarily while another member of staff is found. This is preferable to closing the station and causing inconvenience to passengers." 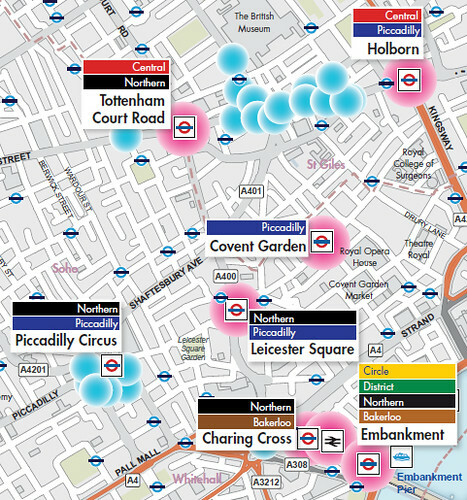 Another day, another London Underground Map mash up. I noticed a map behind the speakers at Foyles' launch of The End of the Line tube horror story anthology and initially thought is was just a normal map. 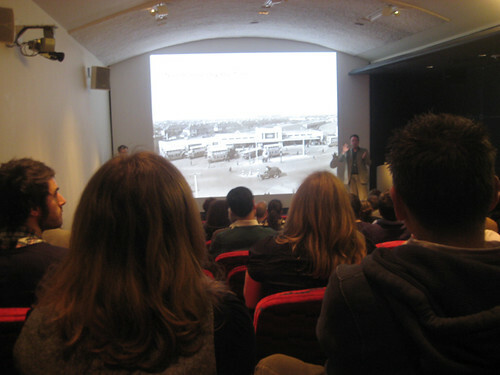 Zooming in on some of the pictures I took during the talks, I realised the names weren't Tube stations. Although Gloucester Old Style, Bank Gothic, Caledonia and Kindersley Street sound like they'd make good station names. 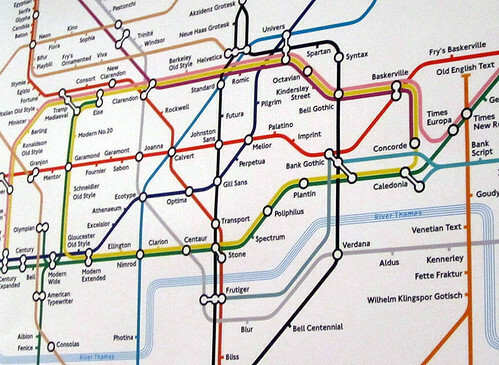 It's a lovely Typographic Tube Map by Eiichi Kono. Kono was commissioned by London Underground in 1979 to develop a new version of Edward Johnston's classic type. His version, New Johnston, is still in use today. Eiichi's typographic Tube map shows all* of the stations replaced with typeface and font names. (*Updated - oops - two are missing as West Hampstead Life notes). 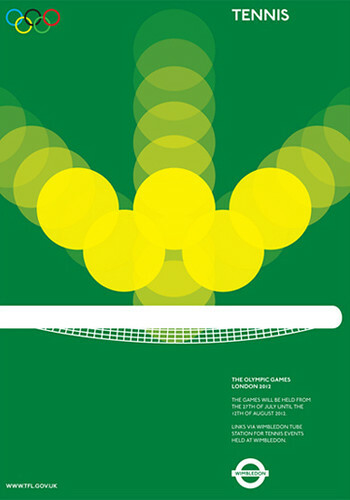 Eiichi was from Japan and came to study graphic design in London in the early seventies. Of Johnston's original font he said "This elegant display type became known as the first humanistic sans serif, in direct contrast to the ubiquitous, over-weight, heavy-handed, tortured-looking Victorian grotesque sans. With ‘Johnston Sans’ and the Roundel symbol, London Transport’s corporate identity had achieved world fame by the 1930's." You can see a larger version of Eiichi's map here. However, the whole thing is on display in Foyles Gallery (Charing Cross Road branch) until 19th November. 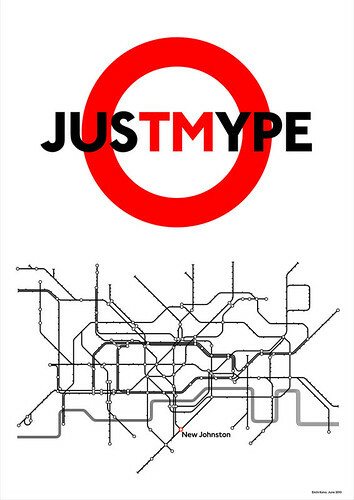 It's part of a collection of typographic posters to coincide with the launch of Just My Type, a book of ‘stories about fonts’ by writer Simon Garfield. More information and images from Eye Magazine's blog post. 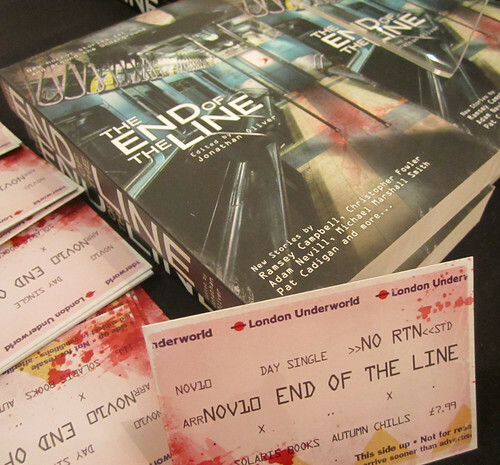 Last night I went to the launch of a collection of short chilling stories set on the London Underground and other subway systems around the world - The End of the Line. 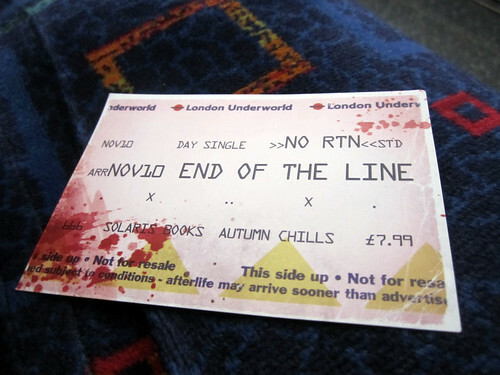 The anthology's editor, Jonathan Oliver, felt that the Underground was a fertile place for Gothic and horror and wanted to rectify what he thought was a lack of stories that covered the darker side of subways. So he commissioned some of his favourite horror writers to create new short stories based in and around the Underground. Initially he was worried that he'd get the same story twenty times, but was pleased this didn't happen. Probably because the focus wasn't solely the London Underground (although I believe the majority of the stories do cover the Tube). Adam Nevill felt the underground reflected a collection of fears, anxieties and frustrations, essential to good horror stories, but put them on a much simpler, everyday level. He said "It's a pressure cooker of discomfort that brings out the worst in people – lack of consideration, invasion of privacy". Pat Cadigan believed what made the underground potentially scary was the feeling of "premature burial. Also on less packed trains, I become a magnet for crazy people", she said. "It's a fertile ground for horror". Of the three, Christopher Fowler, was the only one who didn't naturally feel the frustration & anxiety on the Tube. He found it quite familiar and comforting as he used it to go to school. We didn't learn too much about each of the writers' stories, but there was enough to whet the appetite. 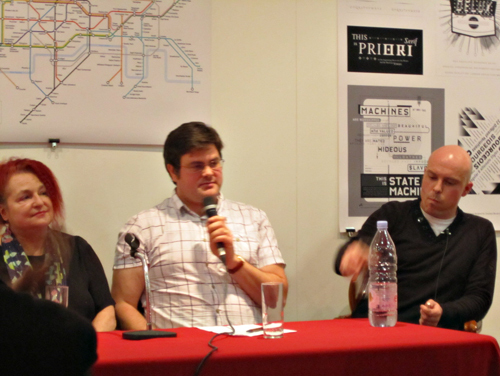 Adam's was based on a real experience he had on the Tube. "It was one of those days. 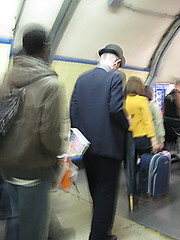 A momentum of clusterfucks, that are quite common on the London Underground – delay after delay. I just wanted to get out of the station, but it was so packed with people not knowing what to do, I couldn't make my way out. I got the inspiration for a story where everyone was zombified, dead or slightly inanimate, but the announcements about delays continued one after the other". Pat was originally going to write a story based on a TV drama she'd seen, where a man was trapped by a subway train, and it was only the train on his body that was keeping him alive. The minute it was moved he would die. She did some research on the internet, to see if something like that could really happen, but urban legend sites like Snopes, debunked the story. So she had another idea in that somehow you could travel from one subway system to another. She liked the thought that there were parallel systems joined together, all running on the same tracks. 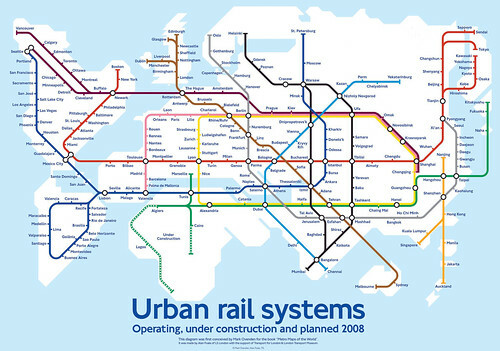 (That reminded me of Mark Ovenden's subway system of the world map below). 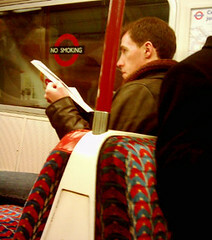 Christopher had studied the London Underground a lot for his previous novels. You may of heard of his fictional detectives Bryant and May who most recently had to solve a mysterious murder on the Tube in "Off The Rails". He'd heard stories about the 'Blitz spirit' on the Tube, when during the war, other disasters & terrorist attacks. He'd always thought it was slightly cliched or 'over egged' until he experienced it himself how people behaved around the July the 7th bombings. "There was an orderly calm. I suppose that's why my story is at the end of the collection. It's kind of like a closure". The authors also spoke of the horror films about the Tube which they enjoyed (or didn't) including Death Line, Creep, Kontroll, American Werewolf in London and surprisingly Sliding Doors "That so should have been a horror film", said Pat. Thanks to Foyles for hosting the event and I'll certainly give a review of The End of the Line when I've had the chance to read it. It sounds like a great addition to the London Underground fiction on my bookshelf. Last week a proposal to revamp Battersea Power Station was given approval by Wandsworth Council. 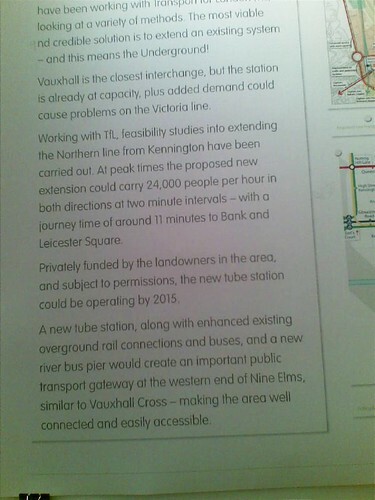 Two new London Underground stations were also part of the package. Planning application Committee Chairman, Councillor Nick Cuff said: "The two Northern Line stations will spur on the regeneration of Nine Elms and bring a huge economic windfall to this part of south London." A couple of years ago, I went along to a walking tour Battersea Power Station and at the time only one new station was proposed. The estimate for building completion, at the time, was 2015 and the proposed extension would carry 24,000 people per hour, with a journey time of around 11 minutes to Bank and Leicester Square. Further information from Battersea Power Station's September factsheet said "The NLE (Northern Line Extension) is currently proposed to be delivered in two phases, with the first phase to tunnel from Kennington to Battersea and creation of the new Battersea station, for an estimated cost of around £400m. The construction of the mid station at Nine Elms is planned to be the second phase, for an estimated cost of around £160m." However last week's pledge from Treasury Holdings put around £203 million towards the extension of the Northern Line (via Build.co.uk). So where's the other £357 million (or whatever is actually needed) going to come from? At time of writing there's nothing from TfL or the Mayor to confirm any spend on a Northern Line extension, but it's probably too early to expect that. As Nick Cuff said "There is still a great deal of work to be done but this is an important step forward". Watch this space for further news. London Transport Museum's Research Fellow, Oliver Green, will be giving an illustrated talk about London's major stations on November 23rd. Oliver's an extremely knowledgeable and entertaining speaker (I've been to a few of his talks before - see below) and has promised to uncover some of the more unusual historical facts and myths surrounding London stations' history over the past 175 years. London has more than twice the number of railway stations than any other city in the world. With 13 main line rail terminals, handling over 400 million passenger journeys every year, in the morning rush hours, a train arrives at a London terminus every thirty seconds. The talk will include a screening of John Schlesinger's award-winning 1961 documentary Terminus, which shows a day in the life of Waterloo station. It shows a glimpse some of the vast array of characters who pass through the station with small stories emerging and reappearing. Oliver's just published a new guide book 'Discovering London's Railway Stations' which will be on sale on the night. Of the book, Oliver says, "All of London's great terminal stations were opened in the 19th century and most of them are still in daily use. My book is a pocket size guide to take with you on a tour of the stations and look at the varied history, dramatic architecture and some of the more curious facts and folklore about them. Why, for example, was it claimed that Queen Boudica was buried under platform 10 at Kings Cross and how does this relate to Harry Potter's journey to Hogwarts?" Tickets can be booked in advance by calling London Transport Museum on 020 7565 7298. They're £8 for adults; £6.00 for seniors and £4 for students. The talk is at the Museum and runs from 6.30pm to 7.45pm. If you're interested in a look at transport during the second world war, this Tuesday 16th November, there's a private view of London Transport Museum's new exhibition, Under Attack, London, Coventry and Dresden. This will be followed by an illustrated talk from Head Curators Steve Bagley (Coventry Transport Museum), David Bownes (London Transport Museum) and Director Dr. Michael Dünnebier (Dresden Verkehrsmuseum). It also starts at 6.30pm and lasts around two hours. The ticket price includes a glass of wine, beer or soft drink. Adults £15.00; senior citizens £12.00; students £10.00. More details for both events can be found on London Transport Museum's site. London Underground posters aren't just for transport geeks, they've warranted an Underground Gallery exhibit at New York's MoMA until January 2011. Now, there's a collection of vintage posters on sale at on November 15 at Swann Galleries . The lot includes this promotion for the Tube and Walt Disney. Mickey Mouse was created in 1928, just six years prior to this poster. As you can see from the estimate price, you'll need to have a fair amount of cash to bid for the posters. But the catalogue is full of wonderful images giving a glimpse into the early days of mass transportation. 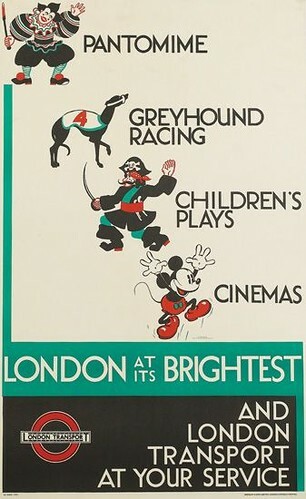 There's 28 unique posters of the London Underground and tramways from the 1920s to the 1940s. 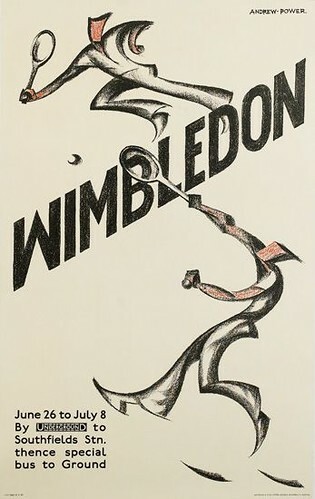 I love the poster for Wimbledon from 1933. It was created by famous linocut artist Sybil Andrews. 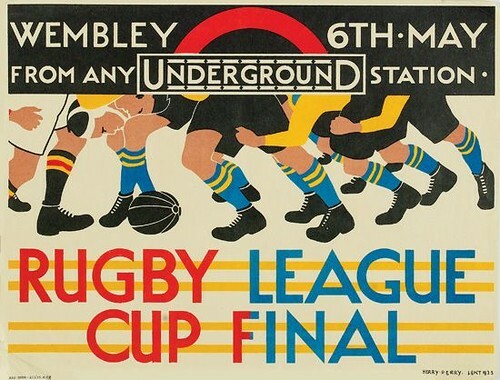 Andrews designed nine posters for the London Underground between 1925 and 1935. Thanks to Swann Galleries for giving me permission to use the images for the blog. 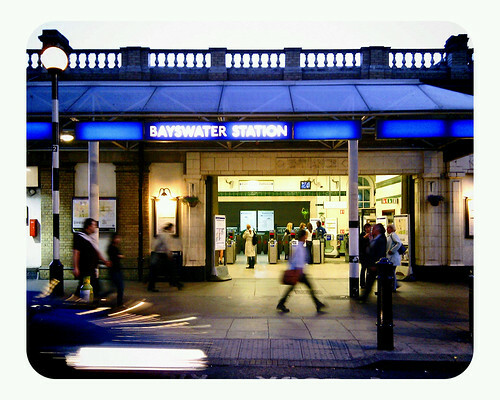 Reports are coming in that a body has been found on the tracks in a tunnel near Bayswater Tube station by Tube staff at around 2.30am. 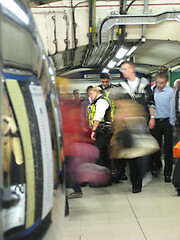 At the moment the whole of the Circle Line has been suspended while police investigations continue. The District Line has been suspended between Earl's Court and Edgware Road and also between Earl's Court and Kensington Olympia. Plus there are severe delays between Earls Court and Wimbledon. Police are currently treating the death as "unexplained". 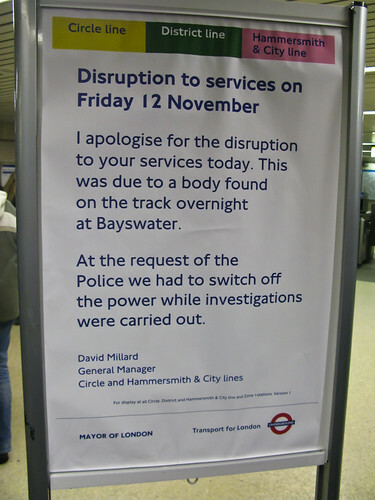 Maintenance crew discovered the body between Bayswater and Notting Hill Gate stations. The BBC now have more on this. In a weird coincidence, only yesterday Londonist posted a story on urban legends involving corpses on the Tube! Now the police have a real mysterious death to investigate. UPDATE - According to the Evening Standard, the body was a 38 year old man from West London. The Standard claim he was trying to walk home through a Tube tunnel. The last train had gone through 90 minutes before the body was found at 2.25am. Police examined the last three trains through but did not find any evidence of the collision. Although they have said the victim's injuries, "were consistent with having been struck by a train". 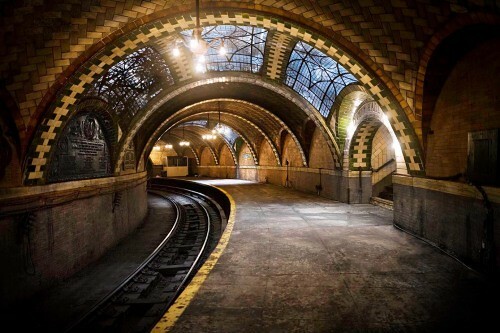 There's a "hidden" abandoned subway station in New York that up until recently has been closed to the public. Well, it's still officially closed and has been since 1945, but now using a "trick" people can get to see the beautifully preserved City Hall station. Until recently the MTA would force passengers to get off the 6 train when it got the end of the line at Brooklyn Bridge. Now as the trains makes the loop to back uptown passengers are allowed to stay on and can see the station. John-Paul Palescandolo and Eric Kazmirek have taken some amazing photos which show a very European-looking (or even Russian-looking) station. See the full collection of shots at Huffington Post. Sadly plans from 1995 to restore the station and turn it into part of the NYC Transit Museum were scrapped. Hat tip to MichalD, MrWeeble and BlueSquareBrig for letting me know about this. Shame there's no loopholes on the London Underground so that we can "unofficially" see some abandoned Tube stations. Re-opening Disused Tube Stations - a step closer? London Underground drivers are to vote on industrial action in a management disagreement over Boxing Day pay. London Underground claim 26th December is an normal working day and a longstanding agreement has been in place with trade unions over pay. However, train drivers' union Aslef claim they have argued the case for additional payments on Boxing Day at numerous meetings with London Underground (LU). The union are now looking for triple time plus a day in lieu. Terry Wilkinson, the EC member for District 8 from the union said today: "It used to be almost guaranteed that if you worked one bank holiday, you would not work the next. But the increase in service levels has meant this is now no longer possible. "We are not opposed to additional services for customers. Why should we be? They help to make our employment more secure.... But we believe that there are times when staff need to be appropriately compensated for working at highly unsocial times - and that includes Boxing Day. "If they get away with this, next year they'll be telling us Christmas Day is a normal day as well!." Unlikely, as the London Underground has always been completely closed on Christmas Day! TfL say the union are refusing to even talk about this and a spokesperson said: "LU has made every effort to resolve this issue with the Aslef leadership, which has refused to attend talks at Acas to discuss its claim for triple time and a day in lieu for its members." As you know there have been three Tube strikes over job losses and ticket office closures. 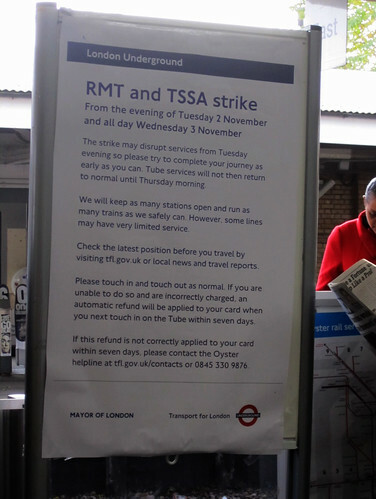 The next strike is planned for 28th November 2010 and the RMT & TSSA union leaders had said they had no plans to disrupt services over Christmas and the New Year. 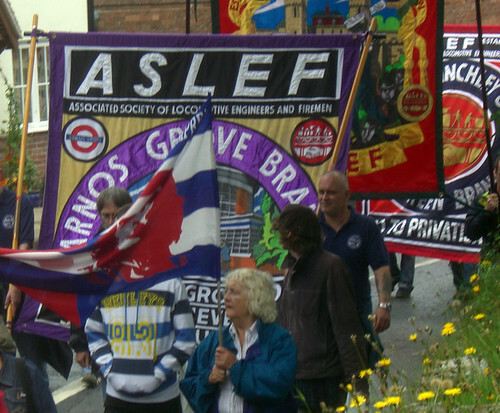 However a memo from Aslef says the recommendation is for strike action over Boxing Day pay to take place on Boxing Day itself. If you like your Tube tales filled with ghosts, ghouls, secret tunnels and "friendly terrorists" you might be interested in a talk taking place this Thursday November 11th. Writer, Scott Wood will be sharing a billing with Anthony Clayton, author of Subterranean City to share stories about Subterranean London Lore. The talk (organised by the South East London Folklore Society) takes place at The Old King's Head Pub, Kings Head Yard, 45-49 Borough High St, London, SE1 1NA at 8pm and costs £2.50. While looking for something to illustrate this post, I came across the fantastic "Slightly Disturbing Tube Map". 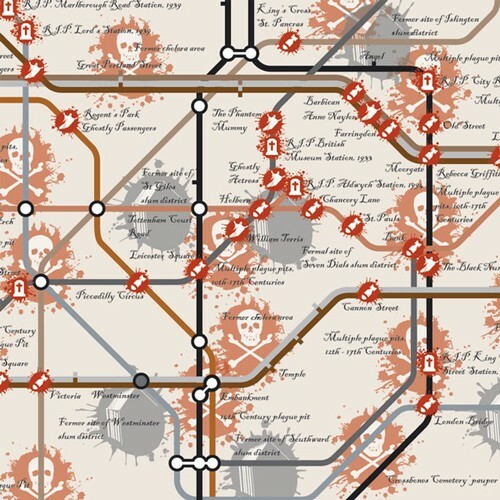 In the designer's own words, the map: "which took ages to do, by the way - shows where Tube lines have cut through plague pits, former slums and cholera sites, and also where all the ghosts and that hang out. For good measure, it also shows where all the abandoned stations are, and also all the stations that were destroyed and such during the war." In size "it's roughly two Jack Russells by three Jack Russells" and costs £19.99. Hat tip to IanVisits events calendar for the talk info. 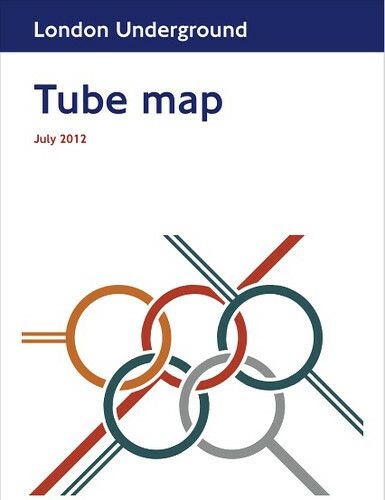 Love this mock up of a 2012 Olympics London Underground Map Cover by Max Roberts. Sadly it's unlikely to see the light of day as a physical Tube map, as the London Organising Committee of the Olympic Games are strict about the usage of their rings. Max says "The logo itself doesn't quite match the way in which the official rings are linked, this is because its actually based on Henry Beck's 60-degree map interchanges of 1940." 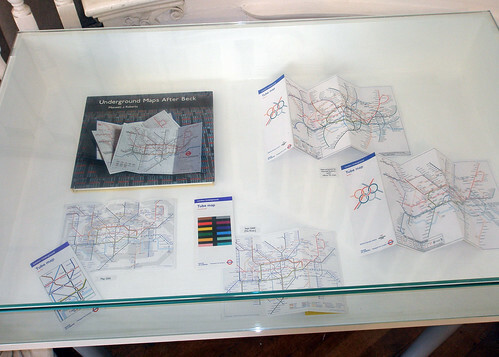 If you went to Max's exhibition on alternative Tube Maps you would have seen versions on display there. Max had lots of positive comments about the design at the exhibition but has heard nothing back from Art on the Underground, who he approached with the idea. I'd be surprised if there isn't some version of an Olympic Tube Map cover in 2012 and I bet whatever we get will probably have those stupid mascots in it somewhere. 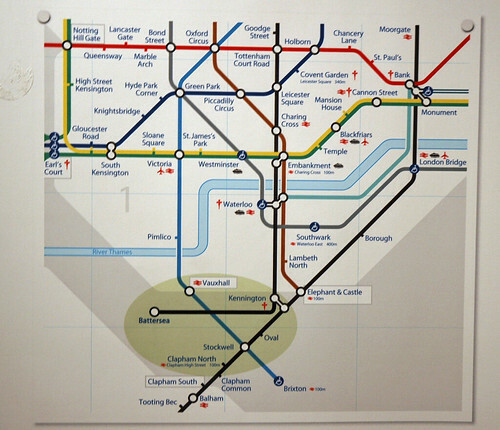 Max's design is clear, simple and effectively brings the Tube Map and the Olypmics together in an immediately recognisable way. 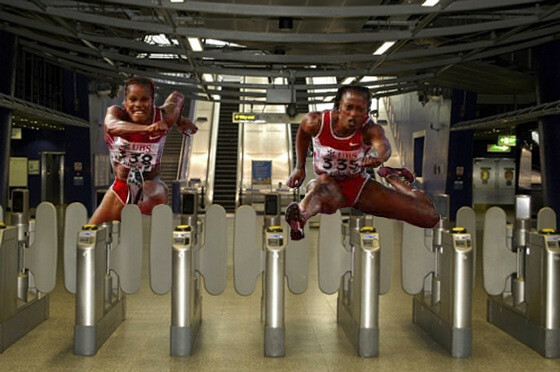 Last month Londonist published a post on some Olympic Tube posters that were also unlikely to be used officially. Such a shame we're stuck with Wenlock & Mandeville, when there's a number of talented designers already producing Olympic mock ups which many Londoners clearly like. I'd love to know who sits in on the focus groups to give the thumbs up to the official stuff! 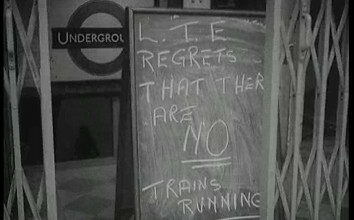 Great video footage from Pathe about how Londoners dealt with an unofficial London Underground Strike in 1962. Very similar footage as to what you'll see today - traffic jams, signs of closed Tube stations - although Boris Bikes were replaced with people on roller skates. Obviously no congestion charge existed then and people could "park almost anywhere". "Buses were packed but hopelessly inadequate. People were realising how much London depends on the Underground", said the voiceover. "Naturally 9 out of ten people were late for work with some arriving at lunchtime". 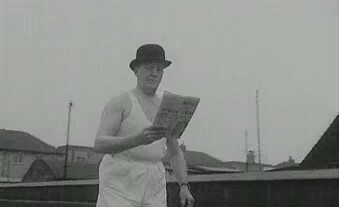 There's some nice touches with a plucky gent leaving extra early work in his bowler hat and underwear. The film ends with motorists giving lifts to people "Some had quite a load" jokes the voiceover as a surprisingly large amount of people get out of small car, including "second class passengers" in the boot! Hat tip to Ianvisits for finding this little gem. From 9pm tonight - 2nd November the TSSA and RMT unions will start the third of their 24-hour strikes. That's drivers and station staff. Maintenance engineers will be walking out earlier at 7pm. Remember as with the previous two strikes, the trains don't all suddenly stop at once, as staff continue working until the end of their shift. Plus not everyone who drives a London Underground train or works at a Tube station is a member of the above unions or will be striking. As before it's best to check with TfL's (now sadly familiar) tube strike page this evening and on Wednesday 3rd November to see what is actually running and what's not (it's been updated to include a list of stations which are expected to be closed). On the last strike in October around 60% - 70% of trains weren't running. Yesterday Boris Johnson called the strikes pointless and said: 'Londoners have shown that they will not be deterred from their daily business by these pointless strikes. 'The action of the union leaderships may cause some inconvenience but we are determined to keep the Capital moving by providing a plethora of alternatives so that people can get around. Transport Commissioner, Peter Hendy, echoed this and said of the unions' grievances over the 800 job reductions: "We have explained that the changes come with no compulsory redundancies and no loss of earnings, and mean that stations will continue to be staffed and every station with a ticket office will continue to have one. "Despite exhaustive talks over the last week, the union leaderships remain intent on disrupting Londoners." 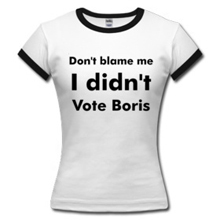 Both unions blame Boris for breaking his election pledges to keep ticket offices open. RMT leader Bob Crow said "The message is simple: suspend these cuts and we will suspend our action." TSSA General Secretary Gerry Doherty added "Instead of trying to impress the Tory shires with his anti trade union rhetoric, he should be sitting down with us to work out a fair solution to this dispute which no one wants." Even though "no one wants" the disputes, we should brace ourselves for yet another strike which is due to take place from 7pm on Sunday 28th November. Commuters now seem to be resigned with the strikes, with no resolution in sight and we could easily see these disputes running through to Christmas. Sadly for Bob Crow he won't find Londoners who want to "look across the [English] Channel to the kind of resistance being mobilized by the French trade unions, which enjoys overwhelming public support." These strikes have an overwhelming lack of public support and I can't see this changing any time soon. Good luck getting to work and home on Wednesday. In case you missed the web's best London Underground Strike Jokes from the Telegraph! It may help to cheer you up! Very few lines are running a full service and those that are have a number of station closures. This is the status as of 9.08am on TfL's site, so please check your lines before travel today. Even though the strike ends at 9pm tonight, things are unlikely to get back to normal until Thursday morning. Good luck!